CLEVELAND, Ohio – The Mid-American Conference announced its specialty awards on Wednesday and three members of the University at Buffalo football team were honored. 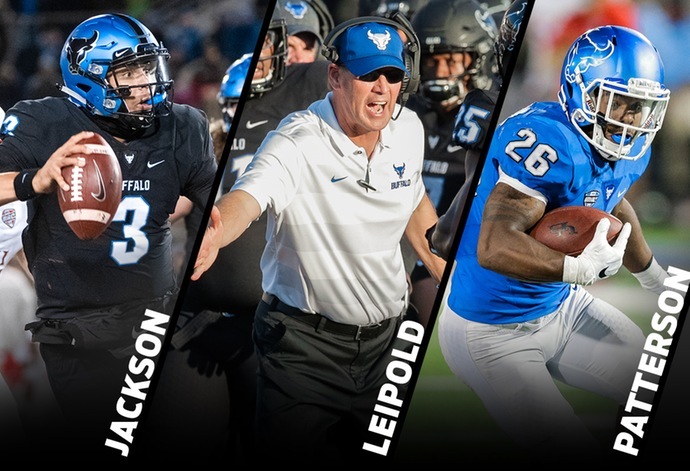 Head Coach Lance Leipold was named the Mid-American Conference Coach of the Year, while quarterback Tyree Jackson was named MAC Offensive Player of the Year and running back Jaret Patterson was named MAC Freshman of the Year. Leipold is in his fourth season leading the Buffalo program and has the Bulls in the Marathon MAC Football Championship Game for the first time since 2008. Leipold has led the program to its first 10-win season in school history. He has the Bulls bowl eligible for the second consecutive season as the program's win total has increased from two wins in 2016, six wins in 2017 and 10 wins in 2018. Leipold is the second head coach in school history to be named MAC Coach of the Year. Turner Gill earned the distinction in 2007. Jackson is the first player in school history to be named MAC Offensive Player of the Year. The junior quarterback has started all 12 games this season for Buffalo and leads the Bulls offense with 2,605 yards passing and 25 touchdowns on his 187-for-337 passing for a 55.5 completion percentage. His 2,605 yards and 25 passing touchdowns both rank second in the MAC. He has also added seven rushing touchdowns and his combined 32 touchdowns are a school record for a single season. Patterson leads Buffalo and ranks fifth in the MAC with 874 yards rushing and his 12 touchdowns are tied for third in the league. Patterson has appeared in all 12 games as a freshman and is averaging 5.8 yards per carry and 72.8 yards per game. He is just the second UB player to earn MAC Freshman of the Year honors, joining former running back Aaron Leeper who won the award in 2002. The Bulls will play Northern Illinois in the Marathon Mid-American Conference Championship Game on Friday at Ford Field in Detroit.